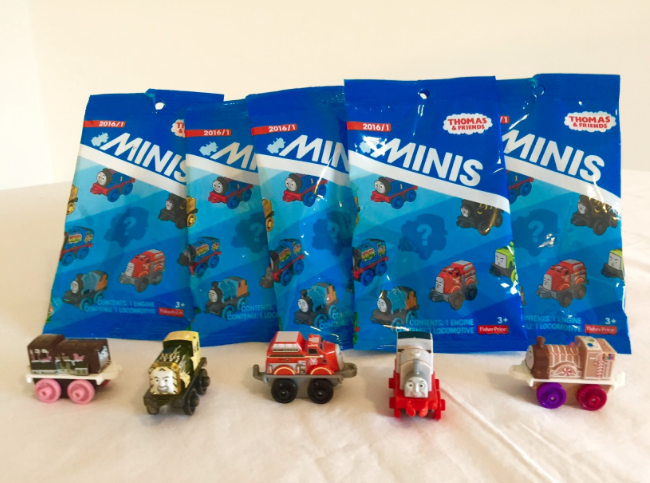 I don't know if any of you have seen these little blind bag packs in the stores. One day we happened upon them in the Dollar Store. I let my 5 and 2 year old boys each get a pack and that is when the obsession started. They are so cute and small. The recommended age is 3 and up, if your child puts toys into their mouth still then these could be a choking hazard. This ended up being a fun thing Rowen gets when we are at the store. They run about $1- $2 dollars a piece and there are SO MANY different trains! Since our collection was growing I wanted to get a case for Rowen to carry them around in. I also wondered if they made special tracks just for these trains. They do have a few different sets that go specifically for these trains BUT I wanted to have more of an open ended toy that Rowen could use his imagination setting up. What I came up with has ended up being one of our FAVORITE toys! I have even caught my 8 year old daughter and her friend playing with it! Another awesome thing is all the supplies cost me under $10, excluding the trains. The three things you need to start are felt (2 green sheets and 1 blue 8X10), BIG "tongue depressor" wooden craft sticks, and a case to hold it all in. 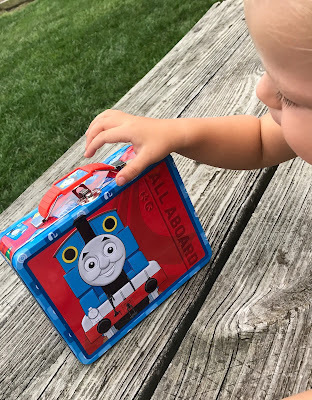 I was going to just use a case I found around the house but I ended up seeing this Thomas the Train tin lunch box case for only $6.99 at Hobby Lobby and then used a 40% off coupon. I call that a score!!! 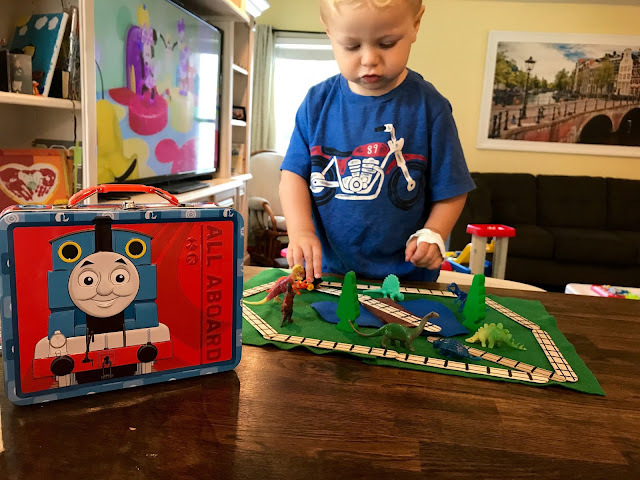 Here is Rowen with his new Thomas box and a few of his trains inside. 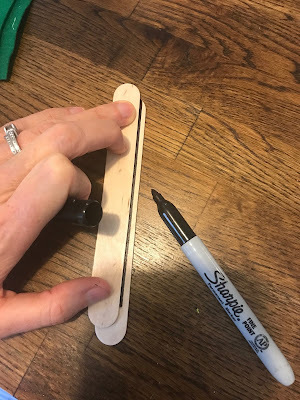 The next thing you need to do is get a sharpie and draw train tracks on the wooden craft sticks. 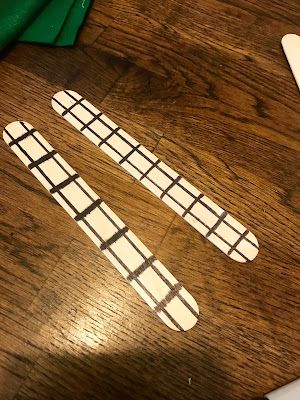 I just used another stick to draw my lines. 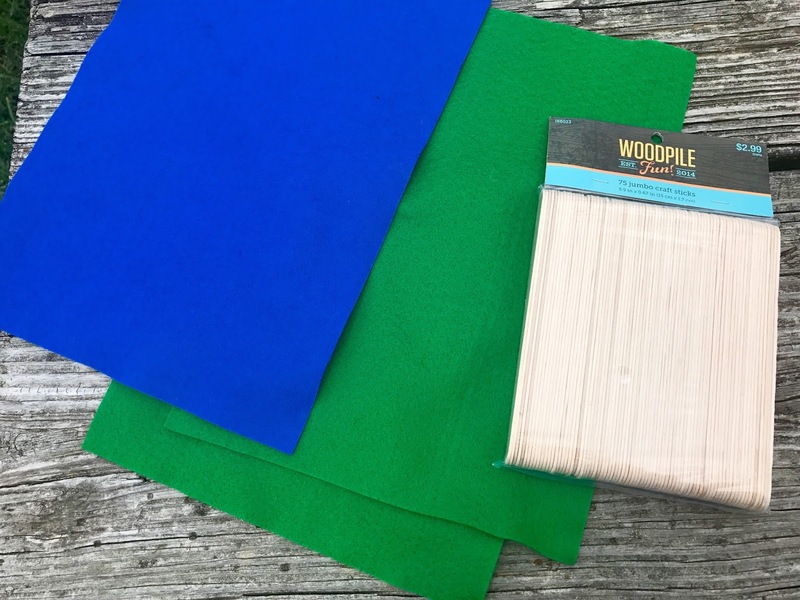 With two basic 8X10 green felt sheets it takes about 8 wooden sticks to make a circle. 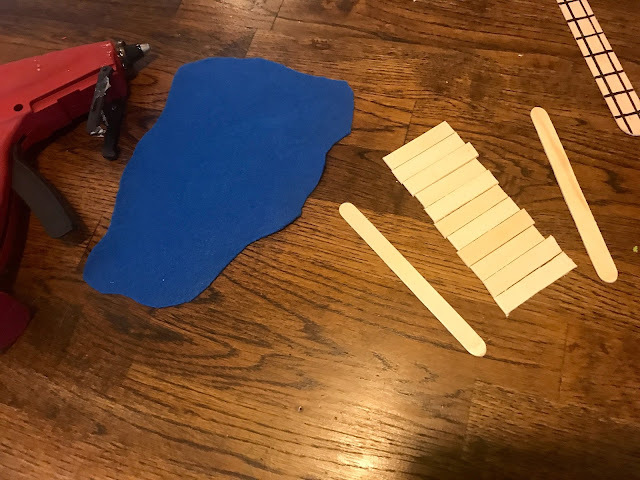 Next step is to cut some water out of blue felt and make a bridge out of popsicle sticks. Your water can be cut in any shape you want. For the bridge I used smaller craft sticks but you can use the bigger ones if you want. 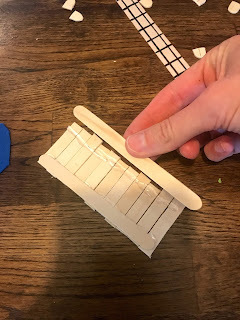 I just cut the sticks with scissors and used hot glue to stick the bridge together. 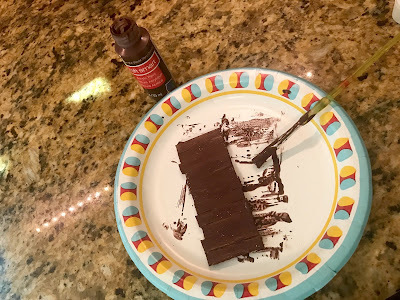 After you hot glue the sticks together just simply paint brown and wait for it to dry. This next step was so fun. 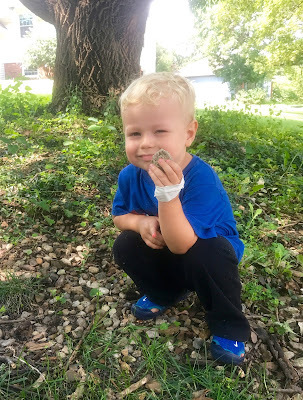 Rowen and I took a special walk to find some perfect size rocks to add to the scenery. After he picked about 3 or four we took them in to wash the with foamy soap. 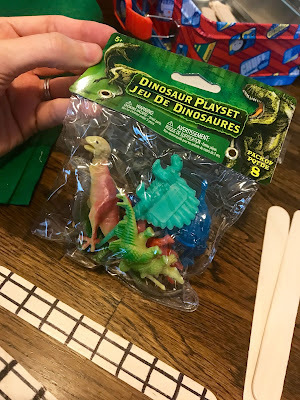 Another simple and fun addition to Rowen's travel train track set is a little pack of dinosaurs we found at the Dollar Store. They also had the option for Safari animals but he wanted the Dinos! After completing those few steps above, you are all set to PLAY!!! 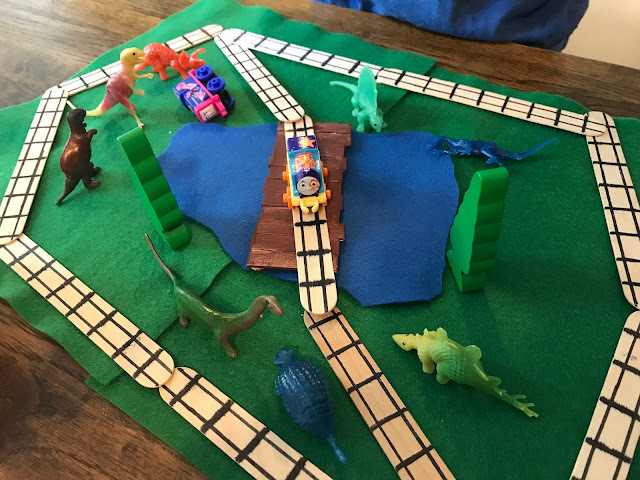 Make sure to make extra track so your child can set it up however they want. They might even want the tracks off of the felt! Here is a special close up of our bridge and rocks Rowen picked out. 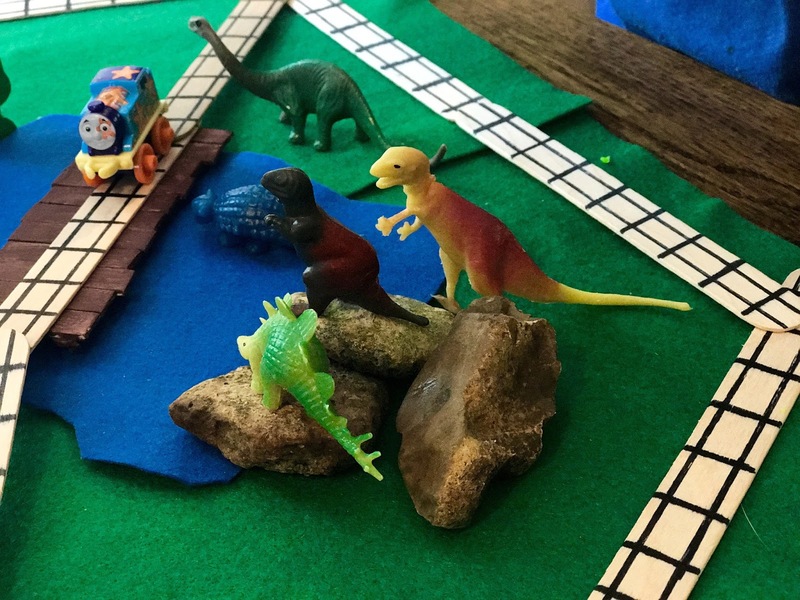 He loves setting the dinosaurs on top of the rocks. 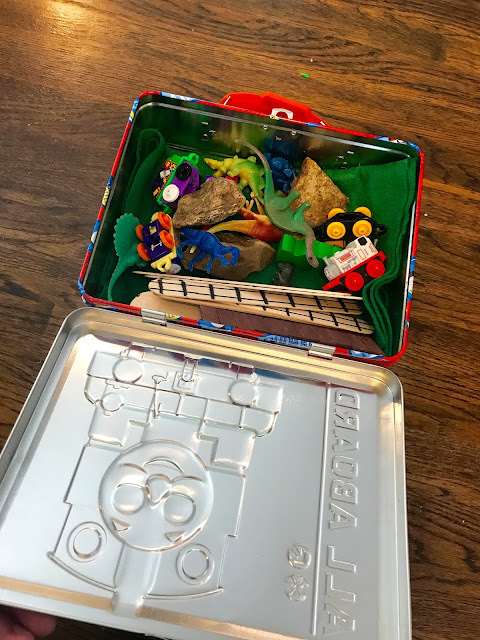 After your child is done playing, just pack it all up in the case and it is ready for next time! 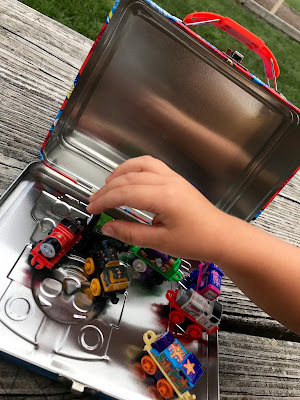 Since it's just Rowen at home with me on the weekdays these days we have many chances to take his travel train set with us to different places. 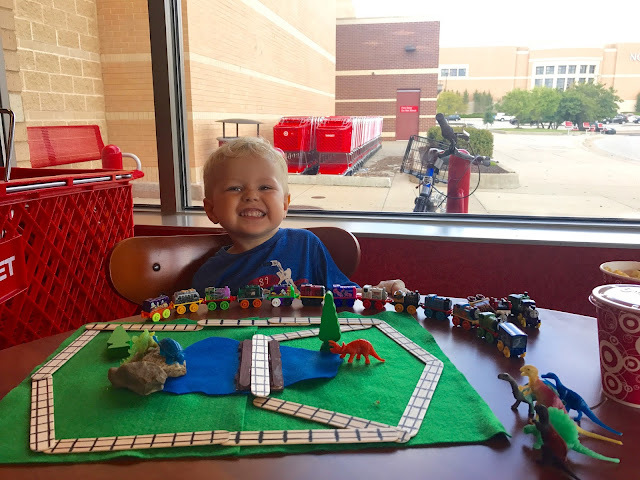 I had an idea to go let him pick out a set of Thomas Mini's at Target. Then we got a snack and played at a table. He had so much fun lining up all of his trains. 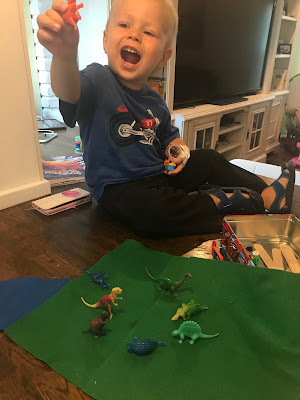 We even played a counting game along with his normal pretending. Here is one last example of Rowen's set up at the Doctors office. 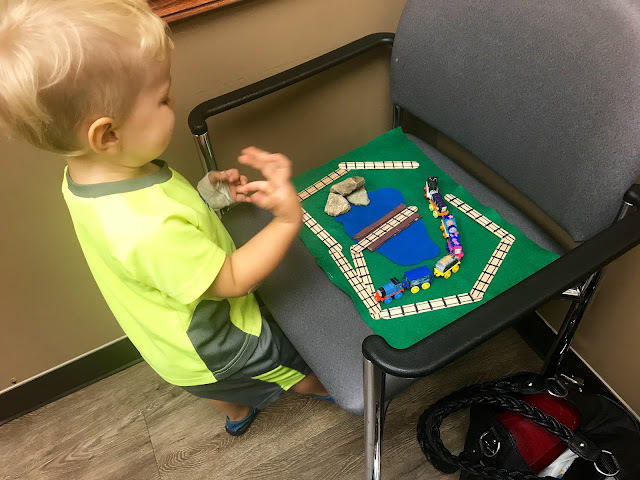 I had a normal check up and Rowen had fun playing while I talked to the Doctor. This would also be a great idea to have on plane trips. 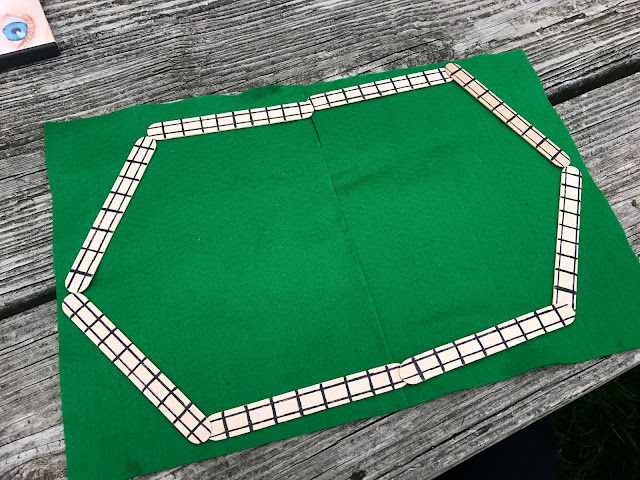 One other thing I was thinking of doing is adding a few micro machine type cars and on the other side of the train track sticks made them road sticks for cars. The other day I was admiring the contrast of the beautiful blue sky and green leaves on the trees. I am beyond excited that it is SPRING! I love seeing all the plants come back to life all around the city. 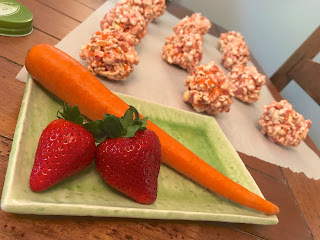 With Spring in mind, I decided to come up with a fun and healthier snack that the kids and I both would love. 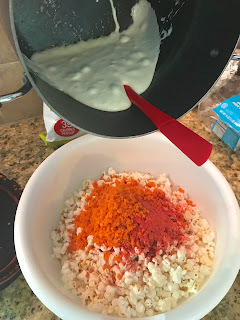 I decided to test out recipes to make healthier popcorn balls. My first thought was to add strawberry. 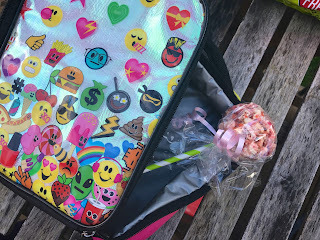 I love the juicy sweet taste of strawberries in the Spring and I also love that they add a natural pink coloring to everything you add them too, NO Red 40!!! Most people who know me, know that I try to add vegetables to everything. 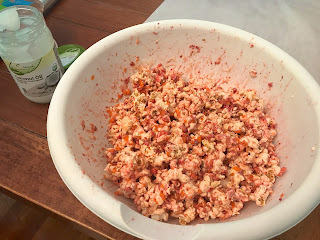 So I thought, why not experiment with this recipe!? What I came up with was beyond delicious! Definitely a MUST TRY, but I warn you they are addicting. I wanted to explain that as I was trying out different recipes, I experimented using no sugar but the balls wouldn't hold up the way I wanted. 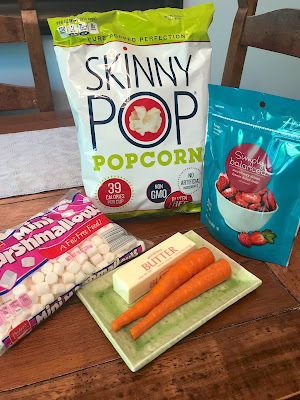 I thought to myself that even if I use marshmallows it would still be fun to see if I can add veggies to something that would normally be considered a treat. 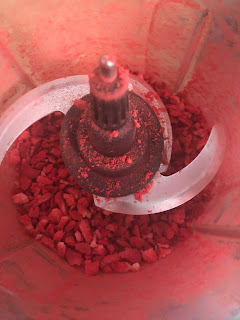 Pour the whole bag of freeze dried strawberries in the food processor and mix until they are in small chunks as pictured above. Set aside. 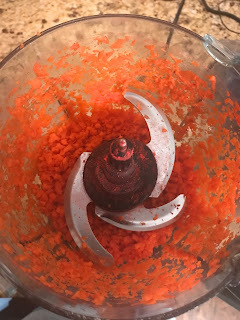 Next add your carrots and blend. 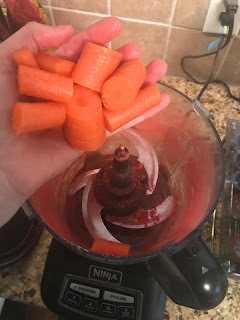 You want to blend your carrots second because they have moisture and if you do the strawberries after the carrots they will end up sticking to the food processor. 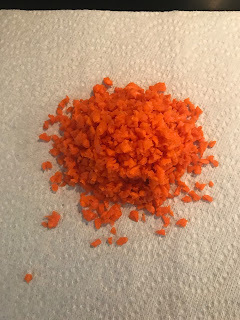 After blending up your carrots and getting about a cup of small chunks, place them on a paper towel. 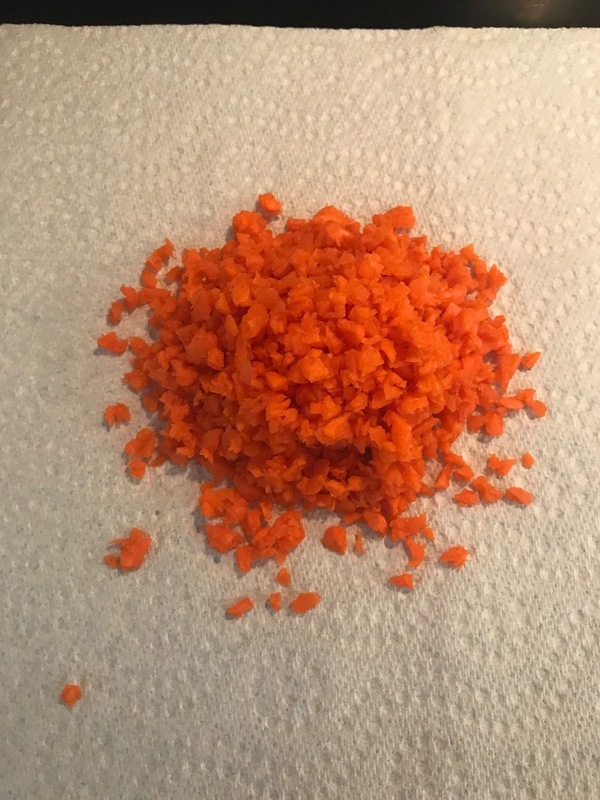 Fold over the paper towel and squeeze to get out as much moisture from the carrots as possible. You can repeat this process a few times. 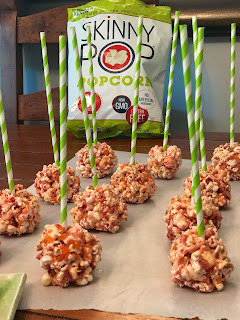 This just helps so that you don't get soggy popcorn balls. 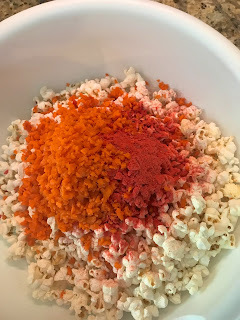 Pour your carrots and strawberries over the popcorn in a large bowl. Heat up your butter and marshmallows in a pot on the stove just until everything is melted. Then pour over the popcorn mixture. 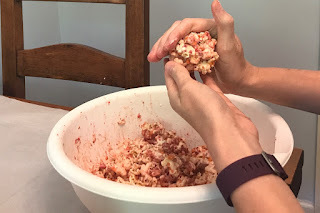 Mix everything together with a spatula or use your hands. 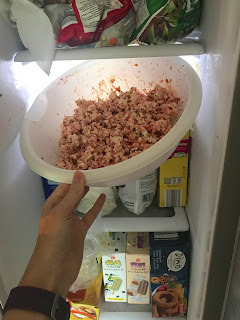 Once everything is mixed together, put the bowl in the freezer for about 10-15 minutes. 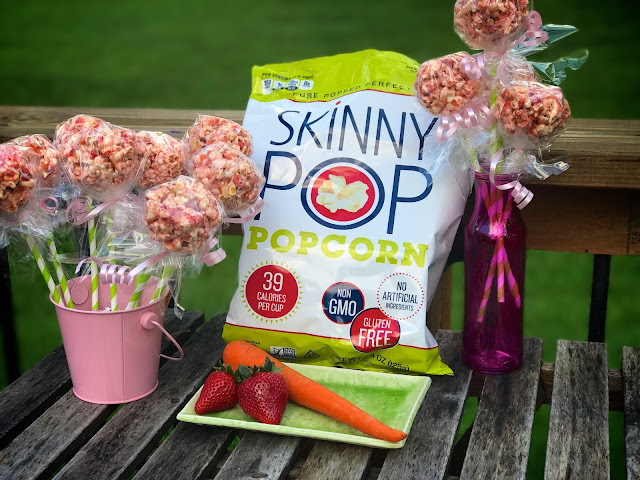 Don't you just love the natural pink color the strawberries gives the popcorn!? You are now going to form the mixture into balls. If it is slightly sticky, you can use a little coconut oil on your hands. This recipe will make about 12 popcorn balls. 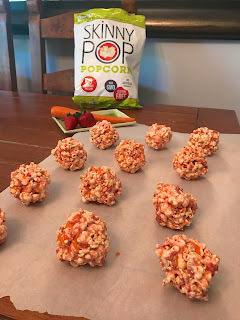 For Springtime fun, I wanted to make my popcorn balls look like flowers. 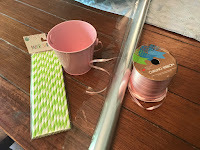 I found some paper straws and a little pink pail in the Target dollar section. The clear cellophane and curling ribbon are from the Dollar store. 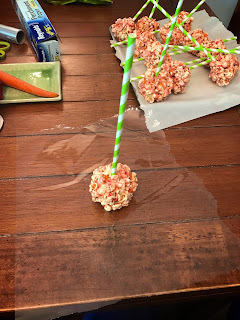 I simply stuck a paper straw in each popcorn ball. I cut the cellophane into 12 large squares. 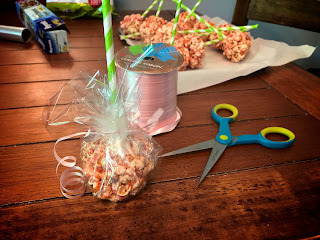 I pulled it together at the top of the popcorn ball and tied it together with the curling ribbon. It is as simple as that! 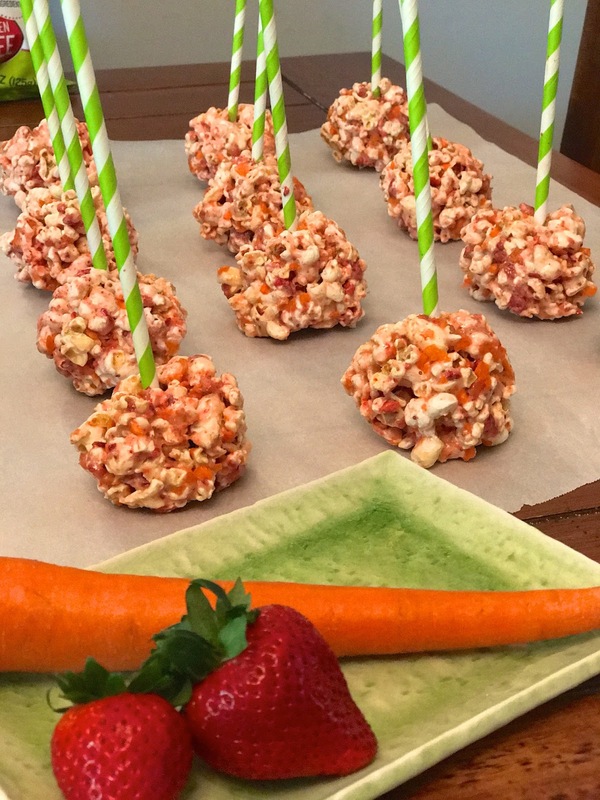 Now you have a fun snack that your kids will be excited to eat! 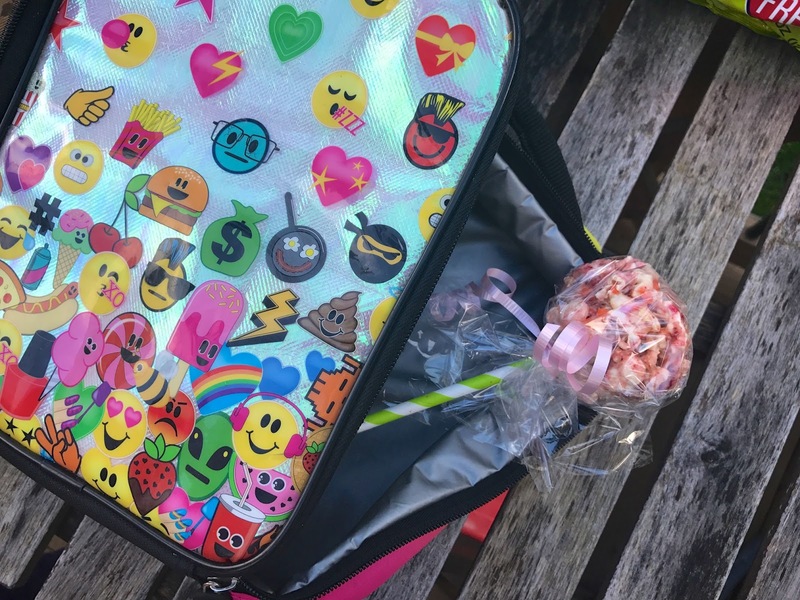 Add it to their lunch as a healthy treat. 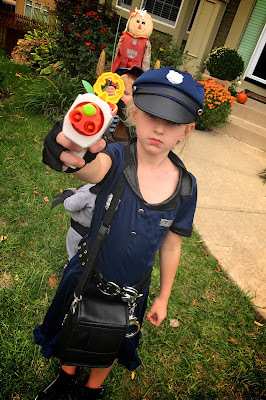 Those of you who have been following me for a while know that I started a tradition in 2012 with my children where we put their hand and/or footprints on the sack they take trick or treating. 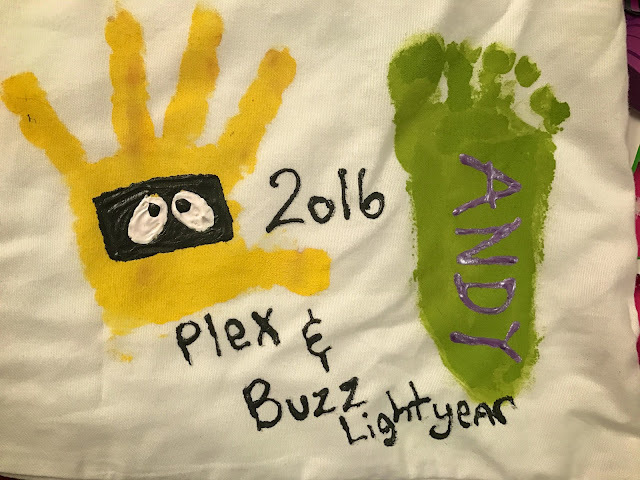 If you want to know more about this click HERE to see the past posts and the hand/foot prints from past years. This year I kept it a little more simple and did only one print for each kid except for Rowen. He is still so little and the prints are just so cute at this age! 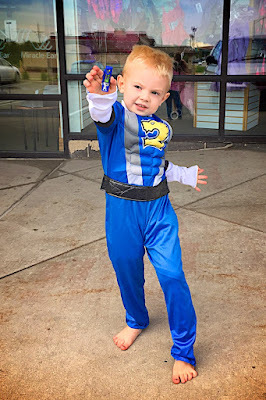 Here is Rowen in two of his costumes this year. 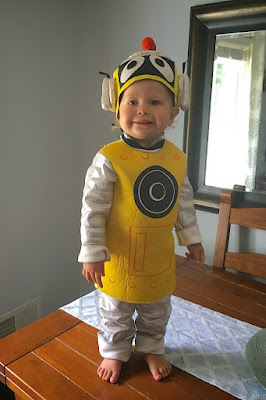 Plex from Yo Gabba Gabba and Buzz Lightyear! 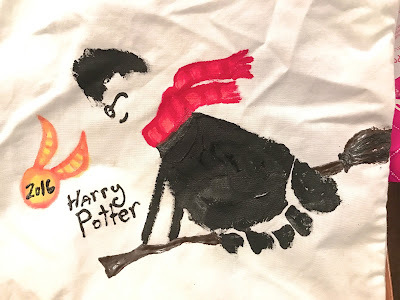 Here are the prints I did for him. 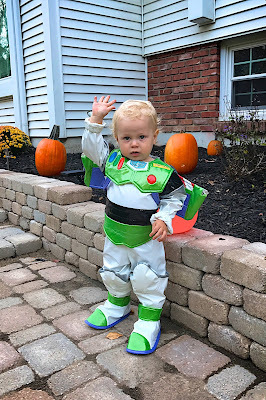 I wish I would have done his footprint for Buzz in purple because that is actually the color of the bottom of his foot. Instead I just wrote ANDY in purple. Garren's foot print turned out better than I thought it would! 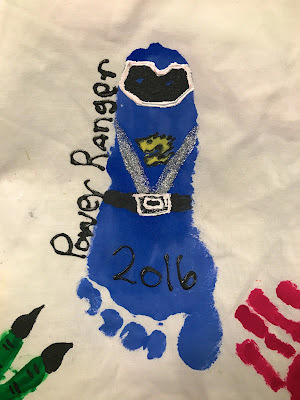 I just copied his costume of a blue Power Ranger to his footprint! 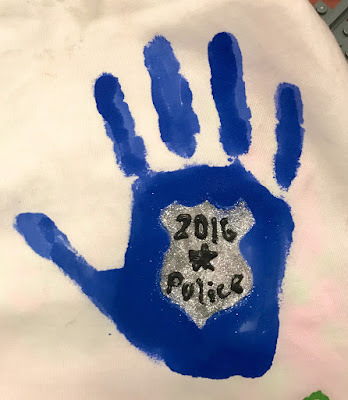 Kiki is a police woman this year so I thought it would be fun to just put a police badge in her handprint! 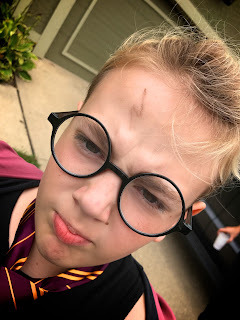 One of Brenden's costumes is Harry Potter so I got really creative with his LARGE footprint! Seriously, just to get an idea of the space this takes up.... he wears size 7 in men!!! Why do they grow up so quickly!? 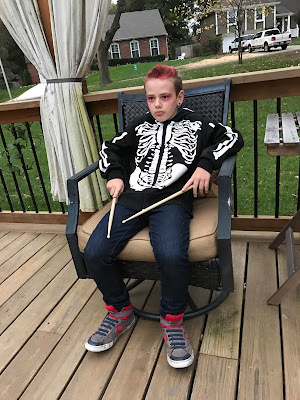 Lastly, I had to add what Brenden is wearing today for actual Halloween Day. 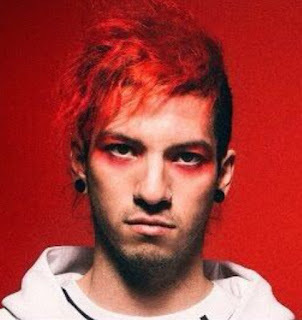 He is Josh Dun, the drummer from my FAVORITE band Twenty One Pilots! Here is full body! 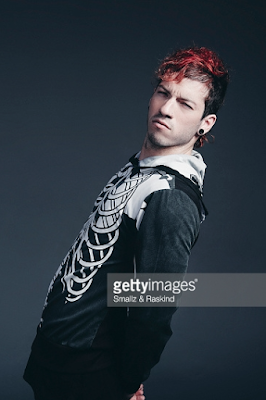 Brenden is wearing his Skeleton hoodie just like Josh and Tyler wear! And don't forget the drum sticks! 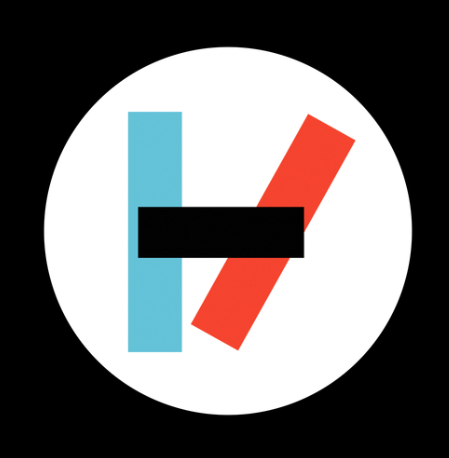 To his bag, I will probably add his handprint in red and paint the Twenty One Pilots logo in the center. 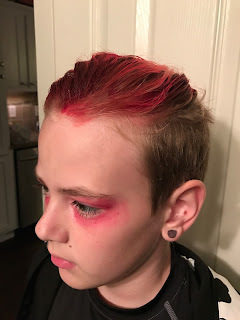 Well, I hope you all have a fun and safe Halloween!! !